- Fix. It was a bad idea to fill list with compatible shaders only. Now list contains all supported shaders if renderer is installed. - Fix. Error when last operation was "Clear map slot" and checkbox was enabled. - New. Script will use shaders and maps that compatible with current renderer. For example VRayHDRI even in Corona. - Fix. Renderer identification system is removed. All related errors should be fixed. - Fix. Mode radiobuttons last state was broken. - New. Last used settings now saved in .ini file and works between 3dsMax sessions. - Fix. Exclude by reflect ior FStorm didn't work. - Fix. Default X position now 200px instead of 1500px, for people who have small resolution screen. - Fix. Error when current renderer is not supported. - New. Partly VRayHDRI map support. - New. FStorm material and bitmaps support. - New. 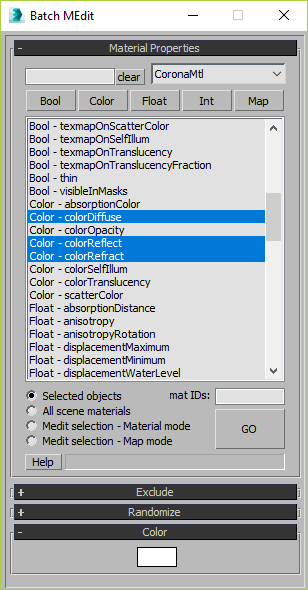 Shaders list will contain only shaders available in current render engine. - Changed. Small changes in Exclude rollout. - Changed. Script is now called "Batch Material Editor" without "Corona". - Changed. Script is now only on ScriptSpot. - Changed. Macro Category was changed to "Nik Scripts". - Fix. Maps mode didn't work. - Changed. GO button disabling behaviour. - Changed. UI disabling behaviour. - Fix. Clear map slot. - New. Randomization of any float and color values. - New. Size, offset, angle parameters for Bitmaps and CoronaBitmaps. - New. Ignore materials by some properties. Works with CoronaMtl and VrayMtl. - New. Properties now sorted by class and name. Class is visible in list. - New. You can filter them via filter class presets buttons or/and by name. - New. Now you can select multiple properties IF all of them share similar output values. - New. Bitmap and Coronabitmap properties. - Changed. "All materials" and "Selected materials" buttons that starts changing property will be disabled when list is empty (if search is invalid). - Fix. Error caused by invalid search. - New. Adaptive dialog height. Submitted by NiK684 on Fri, 2019-03-08 11:36. Hi. This script is mainly for editing materials, not maps. Not all bitmap properties are implemented. I'm too busy at this moment to make a new version. Just put it in listener and hit Enter. You can undo this operation. Submitted by RiZe on Tue, 2019-03-05 07:40. Created an account just to reply. Hi there, I installed this so I can change every material opacity settings, in my 2000+ object max scene, in mono channel output from RGB Intensity to Aplha (does this script even do that?). Opening the script opens the little window fine but it shows the material properties and randomise drop downs only and there is no materials for me to edit, everything is blank. How do I use this? Thanks. Submitted by Jamie Murphy on Mon, 2018-11-26 16:08. I use this daily with Fstorm, it's great. I would love the ability to copy map connection from diffuse to translucency and add a colour correction node with access to the adjustments. Submitted by mykita on Thu, 2018-11-22 02:10.
it says "Materials: 0 Maps:0" even though I have selected my materials and hit "GO". What am I dong wrong? Submitted by NiK684 on Thu, 2018-08-02 01:14. 429 it's not only about traffic. This time I was banned because I shared crack file via piblic link :) My mistake. I'm waiting for support answer. Submitted by Nguyễn Văn Thành on Sun, 2018-07-29 20:02. Submitted by igamaximus on Sun, 2018-07-29 01:59. Nik, could you please add finalRender support if i send you MXS property names of relevant materials? Submitted by slavonec on Thu, 2018-07-26 00:58. Hey Nik put that file somewhere else, please! That is the message I get when I try to download the script. Can you move it somewhere without download limits, please? Submitted by NiK684 on Fri, 2017-08-04 04:05. Submitted by garretthoyos on Thu, 2017-08-03 11:11. Thank you - this script is awesome. 4. Click and drag "batch materials" to your toolbar. I'm using it for editing multiple bitmaps, works flawlessly so far.